Harikrishna Pai is a role model for many students who wish to prepare for Civil Services Exam along with studies. He had a vision early in life and managed to study for a totally different exam during his engineering college days. The result: All India Rank 218 and a probable selection into the Indian Police Service at the first attempt! He is a testimony to the expression ‘An early bird catches the worm’. Let’s know from Harikrishna Pai, how he cleared Civil Services Exam in the first attempt and ask if early orientation is necessary. 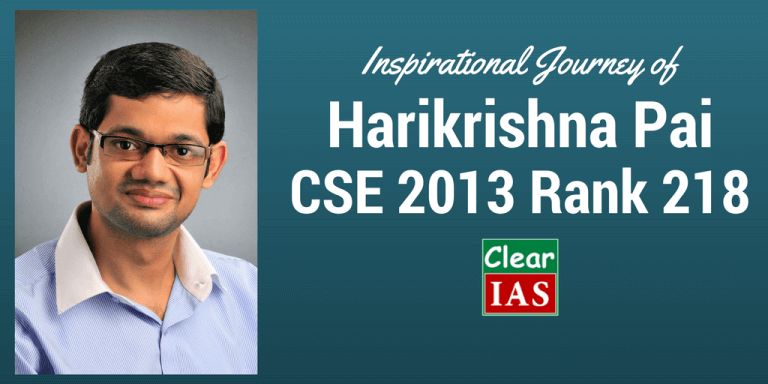 Let’s welcome Hari to the “UPSC Toppers Interview” at www.clearias.com. I was at Pala when my friend informed me about the result. Truly, it was an exciting moment. 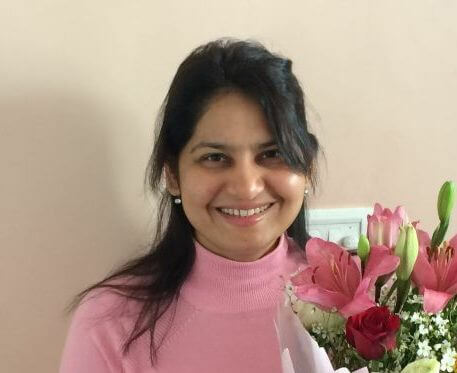 But the dominant feeling was satisfaction about successful completion of my efforts…I felt the urge to share my joy and gratitude with my family, teachers and friends who supported me immensely all through the way. I contacted them, spent the evening with my friends and teachers and joined with my family the next day. My father retired as a medical representative, mother is working as a teacher in a government school, and my younger brother is studying BHMS. My parents gave prime importance to our education and character building above everything else. After my primary schooling in Chinmaya Vidyalaya, I moved to JNV in 6th standard. Here, students were supposed to involve in many activities, both curricular & extracurricular. These helped to build confidence to move ahead. The college days at LBS were also busy owing to numerous activities like Debate & Literary club, NSS, Quizzing etc. After B.Tech, I planned to go for Civil Service preparation, but at the same time had got admission for M.Tech at RIT, Kottayam. So I joined Civil Service Institute, Pala for Add-on classes (Saturdays & Sundays). 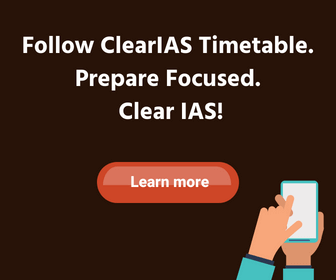 ClearIAS.com : You are a role model for many students who wish to prepare for Civil Services Exam along with studies. Can you explain to our readers how you managed to study for a totally different exam during graduation/post-graduation days? As I told you, I had joined for weekend classes during my Post Graduation. M.Tech days were quite busy, but I fortunately had some flexibility in my final year, while I did my project & Industrial Training and found some free days in between to keep going with the preparations.. My teachers & friends at RIT, with whom I had shared my ambition, also supported me. Even while I was studying, I followed newspapers well, though much time was not left for studying other subjects. ClearIAS.com: B.Tech, M.Tech and entry into Civil Services at first chance! Can you brief us your thoughts, views and ambitions when you climbed each position in the ladder of your life, right from graduation? For each milestone I crossed in my life, there has been immense support from the people around me, especially my family, teachers and friends. This fact kept me well aware of the reality that our achievements are not purely ours. In fact, those who knew my ambition inspired me to work more so that it can be turned into a reality. They kept on reminding me that I have miles to go ahead in my life. This keeps me moving. Entry into civil service itself is yet another reminder – that now the hopes & responsibilities are on a yet greater level. ClearIAS.com : Do you feel that the competition level of UPSC Civil Services Exam is on a rise? It seems that there is an increasing trend of candidates from IITs, IIMs and AIIMS attempting and clearing this exam. Is Civil Service the final destination /ambition of Indian youth, in this age of lucrative private sector jobs? I feel that Civil Service had always been a career that our youth has always aspired for. Now a days increasing access to resources and exposure has generally helped the people in rural areas also to prepare themselves well for this exam (a big thanks to IT 🙂 ). It is also true that the students from the premier institutes too come in large numbers (even setting aside lucrative MNC jobs). All these show the broader reach that Indian Civil Service had made over these years. Naturally there will be more competition. The nature of exam also has been more dynamic which attracts more people to give a try.